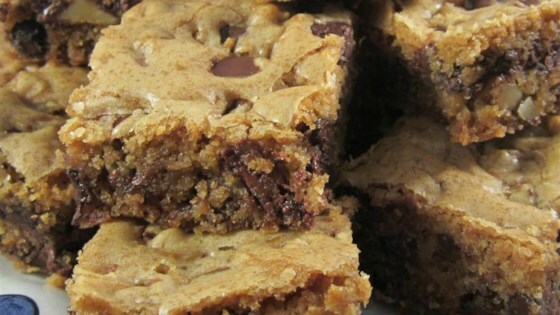 "Awesome cookie bars for when you don't feel like standing around to make dozens of cookies." I didn't read the reviews so I baked for 40 minutes. They smelled a little burned and were hard around the edges. They taste ok, just not what I was expecting. These were DELICIOUS! This recipe is definitely a keeper. I may never make the traditional round choc. chip cookies again...soooo much easier! Follow the recipe exactly and they turned out great. Glad I read the reviews first. 30 min. is perfect time, anything more would be overbaked. Otherwise, followed recipe to a T & very happy with the results! This is like the recipe I got from MGH nursing school over 50 yrs ago, and still addictive. Cut recipe in half because I didn’t have enough butter. Also used semi sweet chocolate chips as that was all I had. Baked in 8x8” pan for 30 mins. YUM! Will definitely make again! we doubled the recipe, added extra brown sugar and some extra chocolate chips. it was amazing!!! I doubled the recipe and added 2 cups of M&Ms. It was delicious!!! Everyone asked where I got it!